The founding principle behind POSTECH’s establishment lies in providing a student-centered education in a highly collaborative and intimate academic community. The university’s undergraduate program is made up of 11 departments (4 science and 7 engineering) and 1 division. The graduate program is made up of 11 departments, 5 divisions, 3 graduate schools, and 3 specialized graduate schools. POSTECH’s student-to-faculty ratio is 5.3:1, allowing students to work closely with our outstanding and award-winning faculty. POSTECH provides the highest educational investment and the most per-student scholarship support in Korea, allowing talented students from all economic backgrounds the opportunity to obtain a POSTECH education. Maximization of the university’s research capabilities has always been the utmost priority of POSTECH. Home to 71 research centers, POSTECH offers many state-of-the-art research facilities, including Korea’s only synchrotron radiation facility. Support on all levels ranging from infrastructure to management and finances have resulted in many distinguished research achievements. 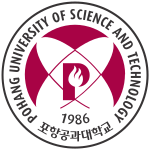 In 2012, POSTECH was ranked first in the Times Higher Education’s “100 under 50” which lists the top 100 universities in the world under 50 years old. Pohang University of Science and Technology is ERCIS member since 2016.